This is particularly true in the defense industry, educational institutions, and nonprofits. The federal rules and regulations are complicated, and organizations must strictly adhere to them in order to stay in good status with government auditors. If regulations aren’t followed closely, a company or organization could be penalized, prevented from bidding on federal contracts in the future, and, in the worst-case scenario, even have work-in-progress yanked out of their hands. Historically, college and university accounting curricula haven’t included courses dedicated to government accounting compliance. I recently researched 20 well-known universities across the United States, and none offered even one course solely for that purpose. The four universities that offered courses in governmental accounting only cover fund accounting for municipalities. There are seminars presented by various organizations throughout the U.S. that touch on government accounting compliance for people who are already working in the field. Yet this topic is needed in the undergraduate studies at universities and colleges. 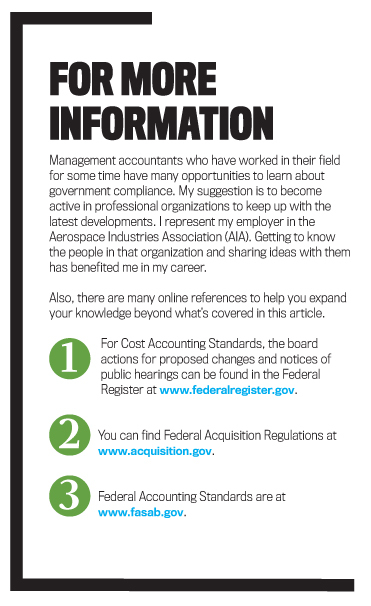 Many great students start their first jobs on the ground floor as far as understanding the complexities of federal government accounting compliance. By having an extensive knowledge of CAS 401, “Consistency in Estimating, Accumulating and Reporting Costs,” and CAS 410, “Allocation of Business Unit General and Administrative Expenses to Final Cost Objectives,” I was a major force in the dismissal of a recent court case, which will save my company more than $17 million. If new graduates could come into the workforce with knowledge of these standards, their careers and employers would benefit. The Cost Accounting Standards Board (CASB), founded in Public Law 100-679, established 19 Cost Accounting Standards for defense companies. 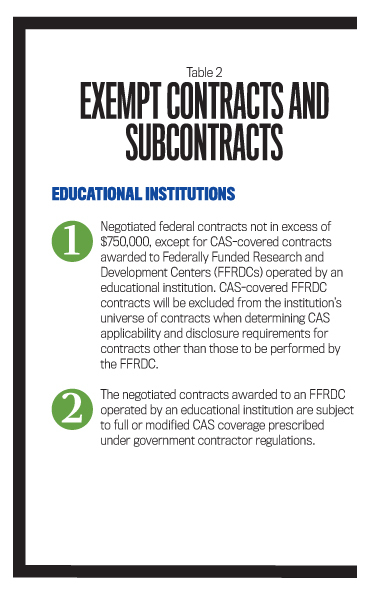 There are categories of contracts and subcontracts that are exempt from the CAS requirements, but all other contracts are categorized as CAS-covered (see Table 1). A contractor must comply with all 19 standards (full coverage) if its business unit receives a single CAS-covered contract award of $50 million or more or received $50 million or more in net CAS-covered awards during its preceding cost accounting period. In addition, the business unit is required to complete a Cost Accounting Disclosure Statement Form CASB DS-1 (REV 2/96), a lengthy document disclosing cost accounting practices. A contractor’s business unit could have modified coverage and only comply with four standards (401, 402, 405, and 406). Modified, rather than full, CAS coverage may be applied to a covered contract of less than $50 million awarded to a business unit that received less than $50 million in net CAS-covered awards in the immediately preceding cost accounting period. The business unit’s CAS-covered contract awards in the most recently completed accounting period are 30% or more of total company sales or $10 million or more. As a part-time university instructor, I always add a touch of government compliance in the courses I teach. So whether you are a student, teacher, or management accountant transitioning into a highly regulated field, here’s a short summary of each of the 19 Cost Accounting Standards. I list them in numerical order—not necessarily the order of their importance to your company! CAS 401, “Consistency in Estimating, Accumulating and Reporting Costs.” This standard ensures that each contractor’s practices used in estimating costs for a proposal are consistent with cost accounting practices used in accumulating and reporting costs. Included here is emphasis on consistency with respect to direct costs vs. indirect costs and the methods used to allocate indirect costs. CAS 402, “Consistency in Allocating Costs Incurred for the Same Purpose.” Each type of cost can be allocated only once to a cost objective (also known as cost object). In other words, the government wants to prevent double counting of costs that could occur. CAS 403, “Allocation of Home Office Expenses to Segments.” This standard establishes the criteria for allocation of the expenses of a company headquarters to the segments of an organization based on the beneficial or causal relationship. For example, personnel administration expenses could be allocated to business units based on the number of personnel, labor hours, payroll, or number of hires at the various business units that report into the main office. CAS 404, “Capitalization of Tangible Assets.” Contractors must establish and adhere to policies with respect to capitalization of tangible assets. For example, the policy may state that the service life of the asset must be a minimum of one year at a minimum cost of $5,000 in order to be capitalized and depreciated. CAS 405, “Accounting for Unallowable Costs.” This standard emphasizes how unallowable costs are accounted for (see Table 3). Unallowable costs must be identified, so many companies have a unique identifier in their chart of accounts to ensure that such costs are captured. CAS 406, “Cost Accounting Period.” The cost accounting period for a contractor usually is the fiscal year. This standard also covers restructuring costs and allows a contractor to amortize such costs over a period not to exceed five years. 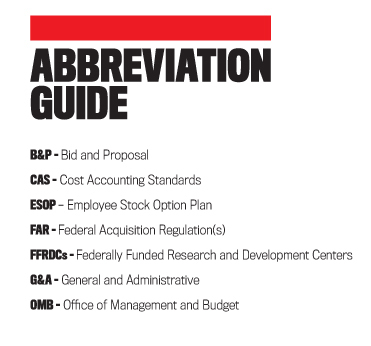 Standard costs are entered into the books of account. Standard costs and related variances are appropriately accounted for at the level of the production unit. Practices with respect to the setting and revising of standards, use of standard costs, and disposition of variances are stated in writing and are followed consistently. CAS 408, “Accounting for Costs of Compensated Personal Absence.” The purpose of this standard is to improve—and provide uniformity in—the measurement of costs of vacation, sick leave, holidays, and other compensated personal absences for a cost accounting period and thereby increase the probability that the costs are allocated to the proper cost objectives. CAS 409, “Depreciation of Tangible Capital Assets.” This standard provides criteria and guidance for assigning costs of tangible capital assets to cost accounting periods and for allocating such costs to cost objectives within such periods in an objective and consistent manner. Allocate the total G&A expense over a total cost input base. This is generally acceptable as an appropriate measure of the total activity of a business unit. Allocate over a value-added cost input, which is total cost input less material and subcontract costs. Allocate over a single element cost input (e.g., direct labor hours or direct labor dollars). CAS 412, “Composition and Measurement of Pension Costs.” This standard provides guidance for determining and measuring the components of pension cost. CAS 413, “Adjustment and Allocation of Pension Cost.” This standard provides guidance for adjusting pension cost by measuring actuarial gains and losses and assigning such gains and losses to the cost accounting period. CAS 414, “Cost of Money as an Element of the Cost of Facilities Capital.” The U.S. government doesn’t allow interest expense as a deduction for work performed by government contractors (see Table 3). As a substitute, the government allows contractors to claim cost of money as an expense of performing contract work. The purpose is to establish criteria for the measurement and allocation of the cost of capital committed to facilities as an element of contract cost. The calculation is the arithmetic mean of the interest rates specified by the Secretary of the Treasury times the net book value of assets in each overhead or G&A pool divided by the allocation base for each pool. 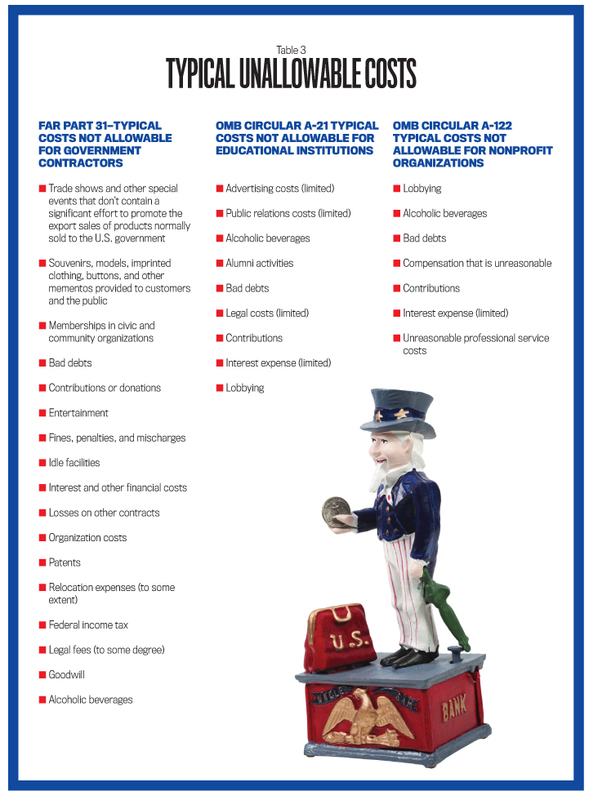 Government form CASB-CMF is available to expedite the computation of the cost of money. CAS 415, “Accounting for the Cost of Deferred Compensation.” The cost should be assigned to the cost accounting period in which the contractor incurs an obligation to compensate the employee. For deferred compensation other than Employee Stock Option Plans (ESOPs), the cost shall be the present value of the future benefits to be paid by the contractor. For an ESOP, the deferred compensation cost shall be the amount contributed to the ESOP by the contractor. CAS 416, “Accounting for Insurance Costs.” This standard provides the criteria for the measurement of insurance costs, the assignment of such costs to cost accounting periods, and allocation to cost objectives. For example, it isn’t proper to charge three years of property and casualty insurance premiums in the current cost accounting period. CAS 417, “Cost of Money as an Element of the Cost of Capital Assets Under Construction.” This standard is a continuation of CAS 414. The cost-of-money rate used in CAS 414 is applied to a representative investment amount for each cost accounting period. For example, the cost-of-money rate isn’t applied to the ending balance in the construction in progress account but to an average amount in the account during the cost accounting period. CAS 418, “Allocation of Direct and Indirect Costs.” The purpose here is to provide for consistent determination of direct and indirect costs, criteria in determining indirect cost pools, and guidance related to allocating indirect cost pools to the cost objectives. For example, is allocation of indirect costs by square footage more appropriate than allocation by hours worked? 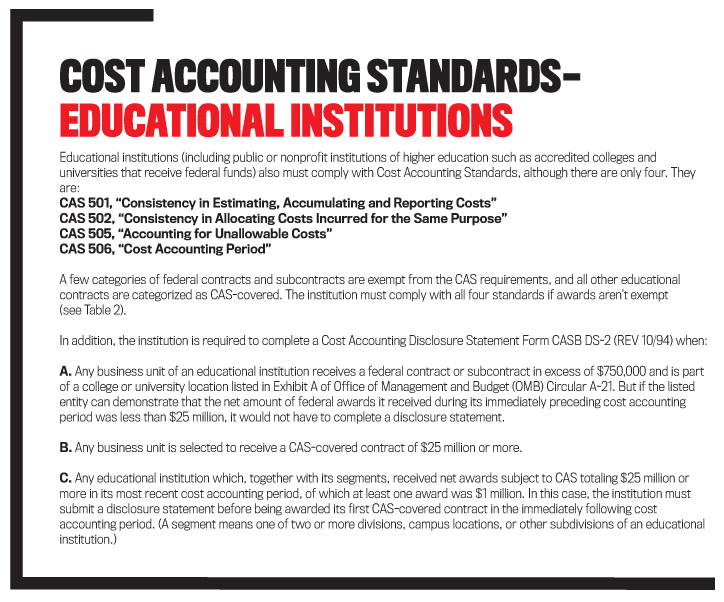 CAS 419 – This section of the Cost Accounting Standards isn’t being used at this time. CAS 420, “Accounting for Independent Research and Development and Bid and Proposal Costs.” This standard provides criteria for the accumulation of independent research and development (IR&D) costs and bid and proposal (B&P) costs. Also covered is the allocation of these costs based on the beneficial or causal relationship between such costs and cost objectives. B&P cost means the cost incurred in preparing, submitting, or supporting any bid or proposal that is neither sponsored by a grant nor required in the performance of a contract. It’s also important for students to learn about CAS for educational institutions. As mentioned in CAS 405, the Federal Acquisition Regulation (FAR), a large, complex set of rules governing the federal government’s purchasing process, lists in detail the costs a contractor or subcontractor can’t claim as an expense when performing work on a defense contract (see Table 3). Failure to identify these costs and exclude them from government work can result in substantial penalties. Many of these costs are deducted when companies perform commercial work, so accounting students and practicing management accountants must be aware of the government regulations in order to avoid penalties at their place of business. 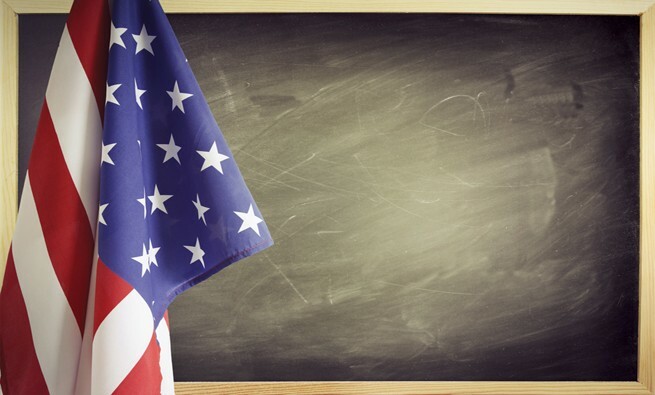 Given the more than $500 billion spent annually on federal government contracts, more training is needed in the curricula at colleges and universities across the U.S. on the subject of federal accounting. It’s also important for employers to be aware of this need so they can hire well-qualified employees. I hope this basic information will help those of you who someday may have to know the rules and regulations in order to work successfully at a defense contractor or subcontractor, an educational institution, a nonprofit organization, or a branch of the federal government. Robert S. Lawson, CMA, CPA, CGMA, is senior manager, Government Compliance & Analysis, Electronic Systems, at Harris Corporation. He is also an adjunct instructor at Drury University in Springfield, Mo., and a member of IMA’s Greater Ozarks Chapter. You can reach him at rlawso05@harris.com. Defense Acquisition University (DAU) offers a classroom course – CON 252 – Fundamentals of Cost Accounting Standards – that is 7.5 days. The course goes over the fundamentals of CAS as well as cost impacts. Mr. Lawson – Any advice as to textbooks that would contain the information you are asking to be taught?